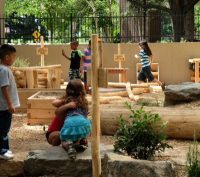 Thanks to the generous support from the US Forest Service, a Nature Explore outdoor classroom has been developed at the Greta Horowitz Learning Center at Warren Village in Denver, CO. This inviting, natural space replaces its traditional climbing structure playground. Warren Village exists to help low-income single parent families achieve and sustain personal and economic self-sufficiency and houses ninety-three single-parent families and has approximately three hundred child residents. 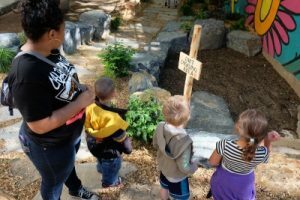 The Learning Center is committed to quality education and the rare diversity of the children it serves rendered it richly deserving of the US Forest Service’s heartfelt award. The Center uses Creative Curriculum, which is a child-centered approach in which the children’s interests drive a variety of projects. 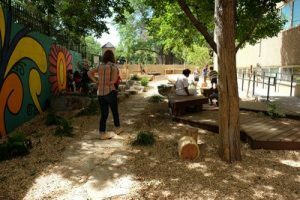 This outdoor space serves as a place to play, but every aspect of the area is a learning opportunity. 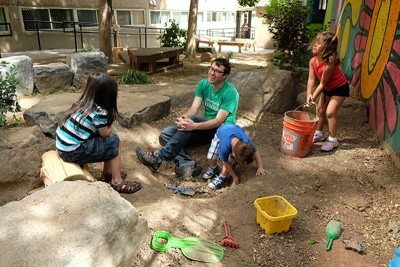 Click to view the Forest Service video highlighting the Warren Village project.